Finally we have gotten over the sickness that we had. It lasted for a week. In the middle of it we had to take Arianna to the hospital because she dislocated her elbow again. 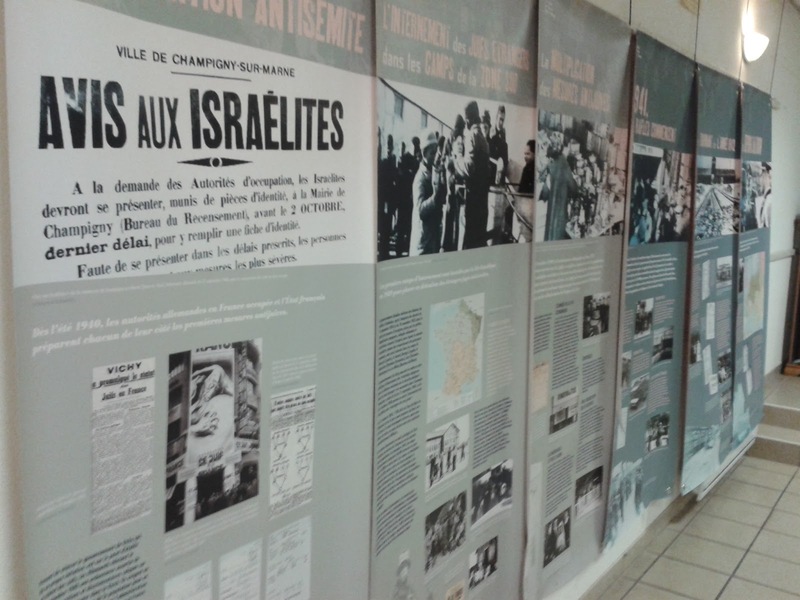 It ended up going back into place by itself before we saw the doctor, and thankfully before we had to pay :) I don't know if I mentioned last time that we (my AVF french class) visited a museum that had an exposition on the French Jews during the second World War. It was very interesting and led to me being able to share about my two grandfathers times in the war during class. 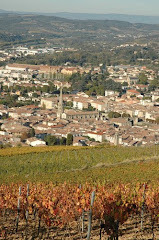 The 11th I had a meeting with the AVF regional committee. It was a good time to meet new people, and get to know our local people better. I usually do not share much when I am outranked, as just vice-president, I usually leave the speaking to the president. But this time I was asked specifically to share my ideas, which I think encouraged those who I will be leading next year, they liked my thoughts and also the fact that I shared more than usual. The following day, I had fever again. Wierd. 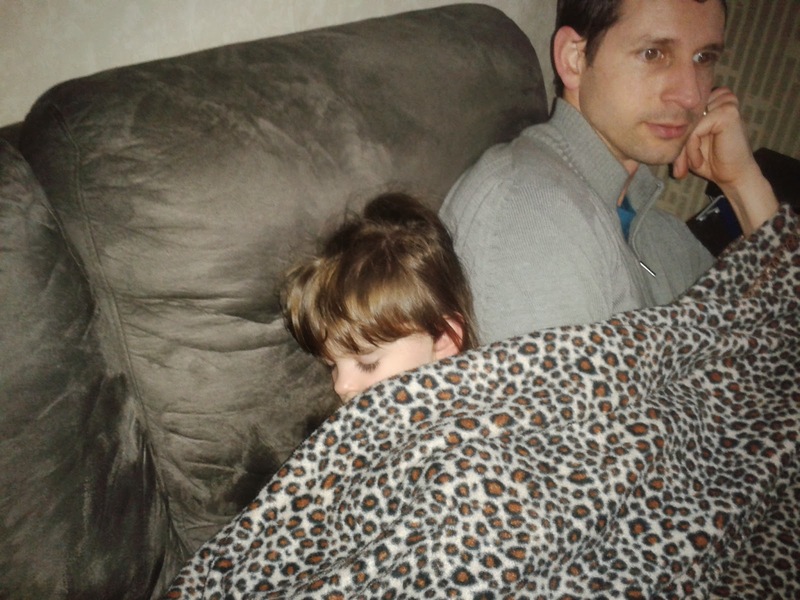 Arianna and daddy, still not feeling 100%. The 14th was our big kickoff for the Friday evening Bible Study. I put a message on facebook ( which for this who are reading and also see my facebooks post...when I post something in French, it is not meant specifically for you, but for the large amount of facebook friends that I have here in France, that is why I don't usually bother with putting a translation, just so you know). We had a good study, 6 visitors came. They all seemed to have a good time, in particular with decoration the cupcakes that Lauren had baked. Saturday, I helped a lady move into a new apartment. It was an all day move, but thankfully there was several helpers. She was single with two children and so I was glad for the opportunity to help and to build another relationship that I hope we can continue. After church on Sunday we had a basketball tournament. The boys and my team played real well, winning all three games by a clear victory. Last week was even busier than normal because I preached in Barcelona, two messages. I also designed a logo for the ministry team that we have coming in June. 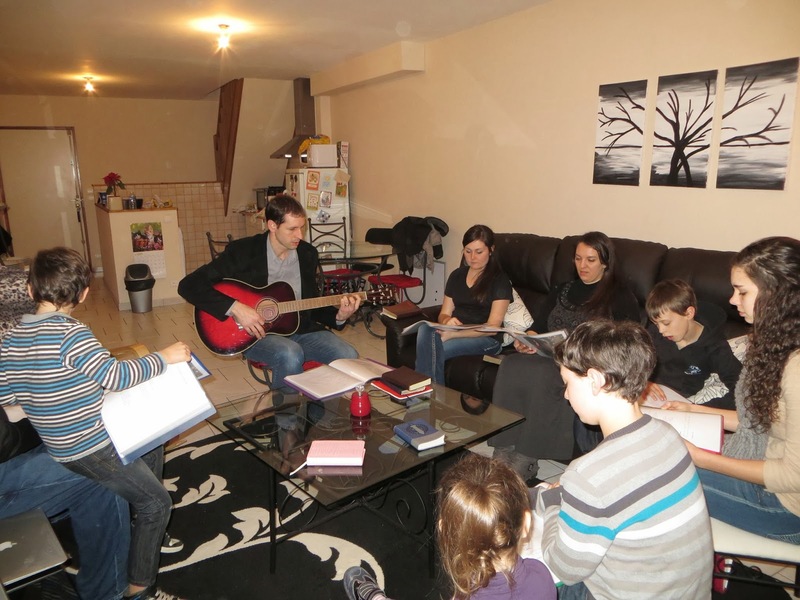 I am getting more and more excited about this team, and I specifically hope that some from our sending church will come along and experience God's work here in Limoux first hand. I did work in a skype call Wendesday with my friend James in Kenya to ask loads of questions about his church planting experiences. I also managed to get our new bank account up and running. Our former bank started charging ATM fees and a monthly fee. The new one looks as if it will work well, even though it was a three week, 20 phone calls, lettes, email. . .sum it up by saying a long and at times frustrating process. Saturday Angie went to youth group, and I was planning to take to kids to an exposition of models, but I forget to get the car seats from Angie and so we just hung around the house and enjoyed the nice mild weather that we have continued having here. Lauren did have us over for supper that evening. The services in Barcelona went good. The blog shows the last time I posted was the 16th of January. Let me catch you up to what has happened since then. The 18th we had a familly over for fried chicken, evidently unknown here in France except through KFC. The 19th after church we had a basketball tournament, and Lauren went with us. The kids playing Monopoly on one rainy day. The weather had been mild, but we have been getting a lot of rain. Some places in France have been flooded for weeks. Saturday the 25th we had a game against another city. It went real well in spite of the fact that they were older, taller, and more in number than we were. The 30th, we had a meeting with the AVF about helping the elderly. It was very imformative considering we have a team coming in June, and we would like to be able to visit the nursing homes and help shut-ins. Lilia left for her school ski trip on Feb. 5th. She had a good time, you can check out her facebook page for pictures. Below is a picture of our English Bible study, Lauren's dad, Mike, taught our lesson. 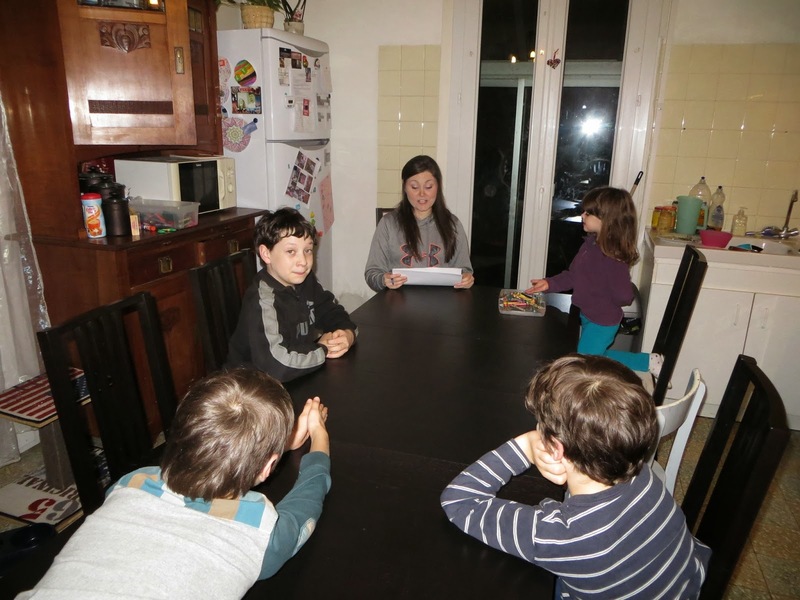 Lauren teaching the kids lesson, in French.